The Orchids of Italy: More Than 100 Species of These Beautiful Flowers. The Orchids of Italy: There Are Many Representatives of This Numerous Plant's Family Across the Peninsula. Orchids of Italy aims at describing some of the members of this huge family, which has many representatives flowering in different parts of the peninsula (above, an image of Orchis ustulata – Burnt Orchid). The Orchid family (Orchideaceae) is one of the vastest among the superior plants, and comprehends about 20,000 species, gathered into about 800 genera. Orchids can be found in all continents except Antarctica, but they are more abundant in the tropical regions. In Italy, more than 100 species of this family are present, but this figure varies quite substantially depending on the criteria adopted for classification. Orchid flowers are composed of six different parts, three of which are covered by the other three in a budding flower. Even though the flower is not differentiated into a calyx and a corolla (as in most other flowers), the more external parts are commonly called sepals, while the internal parts are called petals, as they often present very different characteristics. In turn, the middle petal differs substantially from the side petals, and it is for this reason termed as labellum: this is invariably the most showy part of the flower – that for which orchids present an originality that distinguishes them from all other flowers in the plants’ kingdom. Orchids have male and female reproductive organs, gathered into a single structure known as gymnostenium – or more commonly column. The Italian species have a single fertile stamen, with the sole exception of Cypripedium calceolus (Lady's Slipper Orchid), which has two. The pollen is not as powdery as in the majority of other flowering plants; instead, in orchids numberless granules are agglutinated into small clusters, gathered in turn into bigger masses (more frequently two; sometimes 4 in the orchids of Italy). Often these masses are endowed with a small adhesive disc known as viscidium, to which they are attached by means of a filament known as caudicola (literally, 'small tail'). Sometimes the viscidia are also protected by a thin membrane known as borsicula (‘small bag’), whose viscous pollen has no definite form. The ovary is always placed under the sepals and the petals, and its form varies from almost cylindrical (as in genus Cephalantera) to swollen and pear-shaped (as in some Epipactis species). The ovary is sometimes fused with the stalk by means of a peduncle, usually short. The fruit of the orchids is called capsule: it is a dry fruit that in maturity splits open along longitudinal lines, which are generally six in the Italian species. Orchid roots are relatively short and sturdy, when compared to those of the majority of other plants. In many orchids of Italy some roots – more frequently two – are very swollen and are called rhizotubers, or more commonly – even though not wholly appropriately – tubers. These can be whole (as for example in genera Ophrys and Serapias), or they can be more or less deeply divided (as for instance in Dactylorhiza); in some genera (Cypripedium, Epipactis, Cephalantera, Listera), the roots are all similar between them and originate from a subterranean portion of stem known as rhizome (in the picture below, the yellow-flowered form of Dactylorhiza sambucina – Elder-flowered Orchid – portrayed at 1,900 m of altitude in the grassy slopes of the Vette Feltrine). Orchid seeds are very small, and a mature capsule can contain several thousands seeds; for their lightness, they can be easily dispersed by the wind at great distances. These seeds – almost totally devoid of reserve substances – manage to germinate only with the aid of a fungus at soil level, which allows the development of an embryo by supplying the organic substances which are necessary to its growth. With the development of the first few leaflets, the orchid will be able to produce autonomously some of the organic substances necessary to its growth through photosynthesis. Part of these substances will then be tranferred to the fungus, thus establishing a fruitful relationship both for the orchid and the fungus. A favorable relationship for all the organisms involved is usually defined ‘mutual symbiosis’ – or more simply symbiosis; the symbiotic association between the root system of a plant and a fungus is known as mychorrhizal. Some orchids (in Italy those belonging to the genus Corallorhyza, Epipogium, Limodorum and Neottia) never develop green leaves, and entirely depend on substances given by the fungus for the whole duration of their existence. These orchids are often defined as saprophyte in current botanical language, although they are – in actual facts – parasite organism in all respects. Only a few of the seeds manage to find themselves in the right conditions to germinate and develop into an adult plant: this is the main reason why orchid seeds are produced in such abundant quantities. It is precisely in order to produce this enormous quantity of seeds that the pollen is not dispersed, but gathered into small clusters: it is in fact not convenient for the plant to invest all of its energies in a number of seeds which is too low, in order for some of them to find the right conditions necessary for germination. The pollen masses are too heavy to be transported by the wind; in the orchids of Italy this function is mostly carried out by insects instead, to attract which orchids have highly specialized, developing varied and sometimes extraordinary strategies of adaptation, accompanied by diversified and highly original floral structures. The various mechanisms for pollination are reported in the description of the different genera. Among the orchids of Italy, some species are widespread and common, and do not present particular conservation problems, while others are very localized or connected to specific environmental conditions – which makes them vulnerable and sometimes even at risk. 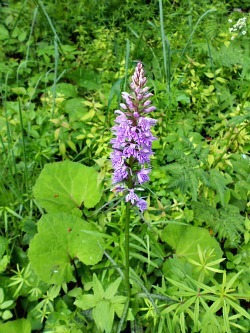 In Italy, for example, many of the orchids connected with wetlands have showed worrying signs of decline – such as, for instance, Orchis palustris, Spiranthes aestivalis and Liparis loelesii, just to mention a few. Without a doubt, it is the species linked with these type of habitats that suffer the most and run the highest risks in Italy; besides, in these last few years we have witnessed a remarkable decrease in rainfall amounts in some parts of the country (especially in the centre-south) and a consequent, relentless lowering of the water plate. 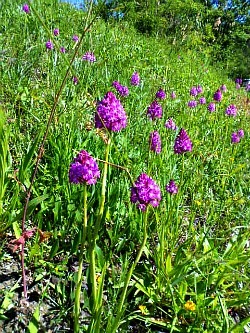 It is not by chance, therefore, that the two rarest species of orchid in Italy are connected to wetlands: Dactylorhiza elata and Hammarbya paludosa. Unfortunately, any type of alteration to the environment reclaims its casualties: one could also mention the problem of urban sprawl along the shorelines, which has substantially reduced the populations of Gennaria dyphylla – a very localized species in Northern Sardinia – or the increase of skiing facilities (ski-lifts and slopes) in the Central Apennines, which has considerably damaged some populations of the rare Orchis spitzelii. Very often, also, even the best-intentioned collecting and a misunderstood “love of nature” end up being the cause of further damages – so my warmest advice here is to never collect wild orchids from nature: it is best to leave this enterprise to scientists and researchers who know how to handle such a delicate job without causing damages which are sometimes irreparable. Recent studies based mainly on the use of molecular markers have revolutionized the classification of Orchids at all taxonomic levels. Currently, the Orchid family is divided into 5 sub-families: Apostasioideae (not represented in Europe, constituted by a few species characterized by the presence of 3 fertile stamens); Cypripedioideae (2 fertile stamens; present in Italy only with Cypripedium calceolus); Vanilloideae (with 1 fertile stamen and pollen of a pasty consistency; not represented in Europe); Epidendroideae (1 fertile stamen with pollen gathered into solid masses, and roots seldom swollen) and Orchidoideae (1 fertile stamen with pollen gathered into solid masses and rhizotubers almost always present). 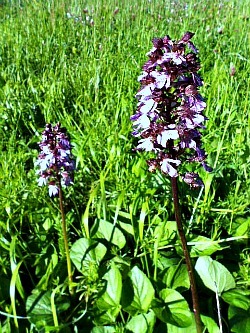 At the genus level, on the basis of study of a portion of the DNA, a classification was recently proposed that entails the fragmentation of the genus Orchis and a consequent restructuring of similar genera (in the picture above, Orchis simia – Monkey Orchid – one of the most particular and interesting native orchids to be seen in Italy, belonging to this genus). The technique used is not, however, the most indicated for phylogenetic studies, and the nomenclature that results is to be considered in all ways provisional: for this reason, in this context, the traditional nomenclature has been maintained, so to avoid a real risk of confusion. At the species level, the situation is also quite chaotic – to say the least: the number of ‘new’ species has grown considerably and exponentially over the last few years, in spite of the fact that the studies based on molecular markers would suggest to be more cautious. Even in this case, the traditional nomenclature has been kept, conditioned also by necessary choices aimed at clarity. Maybe this is not the best time in botanical history in which to write about the orchids of Italy, but these magnificent flowers inspire such a loyal following in many that I thought it a necessary – and hopefully useful – task nonetheless. 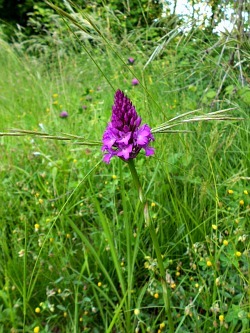 Anacamptis. The genus Anacamptis was instituted for the sole species A. pyramidalis, characterized by a labellum endowed at the base with two convergent gills (lamellae) and just one viscidium, elongated transversally. Recent research have highlighted an affinity with some species of the genus Orchis, thus posing some interesting systemic problems that would deserve further investigation. The flowers of Anacamptis pyramidalis are perfectly adapted to pollination by moths. The introduction of the insect into the narrow aperture that allows access to the long, thin spur containing the nectar is facilitated by the two converging gills, situated symmetrically at the base of the labellum. In carrying out this operation, the butterflies remove the pollinia, whose long viscidium contracts rapidly until surrounding the insect's nectar-searching apparatus and strictly adhering to it (in the first picture below, an image of A. pyramidalis – Pyramidal Orchid – taken in the middle-altitude pastures of Alpago; the second picture displays a beautiful gathering of blossoms near Passo della Raticosa, in the Northern Apennines). Barlia. This genus is strictly akin to Himantoglossum, and differs from it only because of the shorter labellum and bracts. The flowers are quite conspicuous and strongly scented, but the nectar is very scarce; they are mainly pollinated by bumblebees. Cephalantera. It is similar to Epipactis for the hypogeal portion constituted of a rhizome; for its sepals and petals similar between them; the labellum subdivided into two parts and the absence of viscidia; it differs, on the contrary, for the ovary, which is sub-cylindrical and not pedunculate, and the more elongated column. The three Italian species have different chromosomal numbers. The flowers of Cephalantera are devoid of nectar and are being pollinated by Hymenoptera insects that mistake the yellow crests present on the labellum for stamens rich in pollen, with which they feed their larvae. Self-pollination is also very frequent – especially in C. damasonium. Chamorchis. It is a mono-specific genus, characterized by ellipsoidal rhizotubers; the leaves are all basal and strictly linear; the flowers have no spur, with each pollinia endowed with a short caudicula, and a viscidium covered by a bursicula. The tiny flowers are pollinated by insects of small dimension, especially Dipterans; it is also to be signaled a high rate of self-pollination, confirmed by the high production of seeds in environments that do not favour the presence of insects. Coeloglossum. In spite of the marked morphologic differences, in recent studies carried out with molecular markers C. viride results strictly akin to species of the genus Dactylorhiza. On the basis of such results – decidedly unexpected – a synonymous equivalence was proposed between genera Coeloglossum and Dactylorhiza. This fact would have as a consequence the transferral of all Dactylorhiza species into genus Coeloglossum, which should have the priority – having been described first. 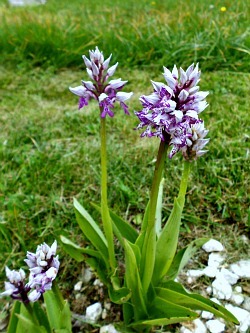 In order to avoid a nomenclature earthquake, however, it was suggested to maintain the name Dactylorhiza at the expense of Coeloglossum – with the subsequent change of name only for the species included within this genus. While the dedicated commission decides on how to act on this proposal, in this context I have maintained the previous distinction between the two genera. 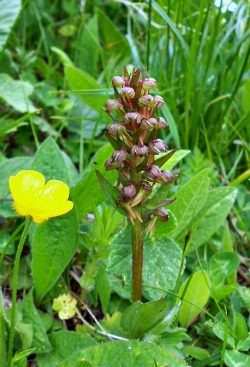 The flowers of C. viride are being pollinated by numerous insects – mainly Coleoptera and small Hymenoptera, attracted by the nectar that drips along the labellum (below, the brownish-green blossoms of C. viride – Frog Orchid, pictured in the Vette Feltrine at an altitude of about 1,900 m). Corallorhiza. The hypogeal apparatus is constituted by a short, flattened rhizome that has the shape of a coral branch from which originate short flowers, without green leaves. The flowers have no real spur, with an elongated column, a reduced rostellum and pollen divided into four clusters and two pairs united to two distinct viscidia, with no bursicula. The genus is almost exclusively American, with only one species that reaches Europe. The flowers are small, without nectar, and prevalently autogamous; that is, the pollen generally does not adhere to the body of the rare insects that visit the plant but ends up falling on the stigma. Cypripedium. This genus comprehends about 50 species, spread over Northern and Central America, Asia and Europe. In Italy and in Western Europe only one species is present, C. calceolus, which is also the only orchid of Italy with two fertile stamens (all the others have one). 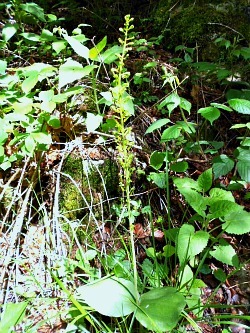 Other characteristics are the wide and swollen labellum and the side sepals fused together. The pollination of Cypripedium is carried out mostly by solitary bees of genus Andrena, which are being attracted by the bright yellow colour of the labellum. Once on the labellum, the insects end up falling into the flowers through the wide central opening, but then do not manage to exit the same way because of the edges folded backwards, which form a sort of funnel. In order to exit from this veritable trap, the insects are forced to make their way through two small openings situated at the base of the labellum, thus scratching their back first on the surface of the stigma – depositing there the pollen which had possibly been gathered from another flower – and then removing the sticky pollen from one of the two fertile anthers in correspondence of the two openings. 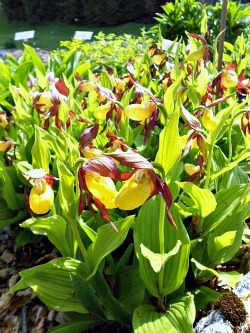 The percentage of pollinated flowers is generally low in the Italian population; the same population can nonetheless present important variations from one year to the next in the production of capsules (below, a beautiful display of C. calceolus – Lady's Slipper Orchid – in the setting of Cansiglio Botanic Garden). 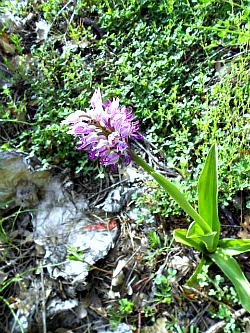 Dactylorhiza. Until not many years ago, the species belonging to this genus were included in the genus Orchis, and it is only after 1976 that the distinction between Dactylorhiza and Orchis has been largely accepted. The genus Dactylorhiza substantially differs from the genus Orchis for the rhizotubers more or less clearly divided, the floral bracts longer than the ovary and the neatly bi-lobed bursicula (more or less round or slightly lobed in Orchis). The taxonomy of the genus Dactylorhiza is also among the most complex and often the object of controversy. The pollination mechanisms have been studied for certain species such as D. sambucina and D. maculata: in the former, pollination is carried out by bumblebees, which visit the flowers attracted mostly by visual stimuli; it is generally accepted that the chromatic variability that can be encountered in D. sambucina is useful to the orchid to prevent the insect from learning too quickly to avoid the flowers, which are mostly devoid of nectar. As for D. maculata, it also has flowers mostly without nectar, and the most efficient pollinators seem to be Coleoptera – mainly Cerambicidae that nourish themselves with the viscous substances produced by the stigma. Nevertheless, the insects that visit the flowers of this orchid are quite numerous, and include Dipterans and Hymenoptera species too (such as those belonging to genus Bombus and Xylocopa), with some bigger specimens efficaciously pollinating some Dactylorhiza species (below, D. maculata – Heath Spotted Orchid, pictured in the lower-altitude woods at the foothills of the Vette Feltrine). Epipactis. This genus is rarely mistaken with others; the hypogeal portion is constituted by a rhyzome, while the flowers are neatly pedunculate; sepals and petals are similar between them in their shape and dimension; the labellum is without spur and also clearly divided in two parts, of which the basal (known as hypochile) is more or less rounded; the column is short, with no viscidia or bursicula. At the specific level, the situation of this genus is rendered even more complicated by the elevated number of species and sub-species described recently, some of which are of a dubious systematic value. Many Epipactis species are autogamous: these are characterized by the absence of a rostellum – or of a rudimentary and not functional one – and by pollen masses that disaggregate, sometimes even within the budding flower; the absence of a rostellum allows the pollen to reach the stigma of the same flower. Among the species reported as autogamous or predominantly autogamous are E. flaminia, E. leptochila, E. muelleri, E. persica and E. placentina; E. microphylla can use both reproductive mechanisms. The species that cross-pollinate attract insects by means of the nectar contained in the hypochile; among the most efficient pollinators for this genus are wasps, bees and Dictera belonging to the genus Syrphidae (below, a beautiful specimen of Epipactis – Helleborine – is portrayed). Epipogium. It is a genus present in Italy and in Europe with one species only; a second one is widespread exclusively in Paleo-Tropical regions. It is characterized by a swollen rhyzome, from which originate scapes with no leaves or chlorophyll. The flowers are pedunculate, with a labellum which is bigger than the other parts of the flower, pointing upwards and endowed with a spur; the column is short, with two pollinia, each of which has a short caudicula and a proper viscidium. The chromosome number has never been calculated for the Italian specimens. Gennaria. This genus is mono-specific; it is similar to Herminium in its general aspect and for the fact of having just a single sub-globose rhizotuber at the moment of blossoming, but it differs for the presence of a spur in the flowers and the pollinia with no caudicula. Little is known about the pollination mechanisms of G. diphylla; surely the species is propagated also through the production of new rhizotubers at the apex of long and thin roots. Goodyera. It is a genus akin to Spiranthes, from which it differs mostly for the hypogeal apparatus, constituted by a horizontal rhizome instead of tuber-like roots. The sole species within this genus present in Italy (G. repens) is also the only one among our orchids to have stolons creeping on the ground, and leaves with a clearly net-like pattern. The flowers of G. repens are often visited by bumblebees and other Hymenoptera, amongst which those of genus Lasioglossum are indicated as the most efficient pollinators. A very important role in the diffusion of this species is carried out by the long creeping stolons, at the apex of which new plantules are produced. Gymnadenia. In this genus the flowers are characterized by a long, thin spur; a short column; an elongated rostellum and distinct, also elongated viscidia with no bursicula. The hypogeal apparatus is endowed with flattened and palmate rhizotubers, divided for about half of their length. This genus is strictly akin to Nigritella, as it can be deduced by the frequent hybrids and also as confirmed by the studies with molecular markers. The Nigritella species, in any case, form a natural group that can be kept distinct – at least at the level of the sub-genus. Strictly speaking, they differ from the Gymnadenia species especially for the very short spur, the labellum pointing upwards and the small, non-elongated viscidia. 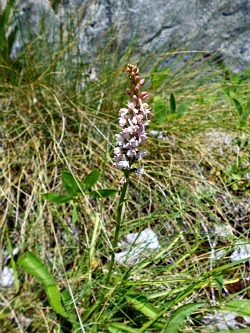 The abundant nectar produced in the narrow and elongated spur of the flowers of the two Italian species of Gymnadenia can only be reached by the thin proboscis of butterflies, which are in all effects the only known pollinators for these orchids (below, the scented blossoms of G. conopsea – Fragrant Orchid – are portrayed along the path to Rifugio Dal Piaz, in the botanical hotspot of the Vette Feltrine). Hammarbia. This is a mono-specific genus strictly akin to Malaxis, from which it differs for less important characters, like the younger pseudo-bulb situated above the substrate, the labellum much shorter than the sepals and the presence of bulbils on the leaves’ margins. The flowers – very small and with no spur – produce a small quantity of nectar at the base of the labellum and are being pollinated by insects also of very small dimensions, mostly Dipterans. H. paludosa owns a unique characteristic among the European orchids: it is propagated by vegetative way, producing small bulbils on the leaves’ margins, which by detaching from the mother plant and falling on to the substrate are being rapidly infected by the symbiont fungi, thus originating new plantules. Herminium. It is a genus represented in Italy (and in Europe) by a sole species, which at the moment of blossoming has only one sessile, sub-globose rhizotuber (from which derives the specific name monorchis), plus other 2 to 5, with smaller and elongated peduncules. The flowers are not showy and with no spur; the pollinia also have very short caudicula, with distinct and relatively big viscidia. The flowers of H. monorchis are pollinated by numerous insects, mainly Hymenoptera and Dipterans, all of which are of very reduced dimensions (1 mm max). New plantules are also produced by vegetative way through the pedunculate rhizotubers. Himantoglossum. The flowers of the species currently being included within the genus Himantoglossum all have a very long medium lobe in the labellum, but this showy character does not seem to be sufficient to separate this species from other similar ones, until not long ago included within the genus Barlia. Common characteristics to all these orchids are the presence of a spur, of only one viscidium and bursicula, and also of a big, whole ellipsoidal rhizotuber. As for the flowers of Himantoglossum, pollination is strictly speaking carried out mostly by solitary bees belonging to genus Andrena and Colletes, and also by honey-producing bees. Limodorum. These are plants with no green leaves; the hypogeal portion is constituted of a rhizome endowed with thickened roots; the flowers have an elongated column and a unique and bi-lobed viscidium, deprived of bursicula. All the species within this genus have a characteristic purple colour which allows easy identification at first sight. Despite the fact that the flowers of Limodorum abortivum produce nectar, which is accumulated in the long spur, the possible visits of pollinating insects – mostly solitary bees and bumblebees – are quite scarce. The seeds are in fact produced mainly in an autogamous way, which is also the only reproductive mechanism in the other two species (L. brulloi and L. trabutianum). In adverse conditions – as for instance in case of prolonged droughts or excessive growth of the surrounding vegetation – self-pollination can happen even without the flowers disclosing (cleistogamic reproduction). Liparis. In this species, the swollen stems at the base form pseudo-bulbs, to the side of which one can find the pseudo-bulb of the preceding year; the flowers have no spur, two viscidia with no bursicula and the pollen is subdivided into four waxy, small pear-shaped masses. 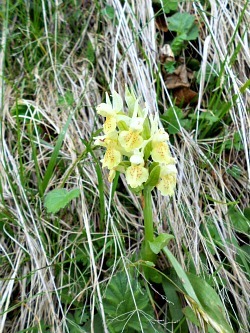 The genus has a very vast area of distribution and it includes some hundreds of species, only one of which, however, is present among the orchids of Italy and Europe (L. loeselii). There is no certain information regarding the pollination of L. loeselii; some authors maintain that this species be autogamous, and that it reproduces mostly via vegetative way. Listera. The Italian species of this genus are characterized by the presence of two leaves only, almost opposed; the flowers have no spur, with a labellum much longer than the other parts, a short column and a rostellum with no viscidia or bursicula. Numerous insects visit the flowers of Listera in order to nourish themselves with the nectar secreted by the glands placed on the labellum; the most efficient pollinators of L. ovata are Hymenoptera species parasitizing either other insects (Ichneumonidae) or plants (Tenthredinidiae). The pollinators of L. cordata are smaller; amongst them, the most numerous are fungi midges (in the picture below, the greenish flowers of L. ovata – Twayblade – blend with the understory in the lower slopes of the Vette Feltrine, near Passo Croce d'Aune). Malaxis. These are plants endowed with two super-imposed pseudo-bulbs; the flowers have no spur, with the labellum pointing upwards, a short column and pollen subdivided into four small waxy masses. It is a vast genus especially in the Tropical region, but represented in Europe by only one species, M. monophyllos; the characters indicated above are referred essentially to this one species. The small flowers of M. monophyllos seem to be pollinated by Dipterans, also of small dimensions. Neotinea. The only characteristics that distinguish this mono-specific genus from genus Orchis are the very short spur and the caudicula of the pollinia, also very short. As for the rest, the similarities between the only species of Neotinea found in Italy (N. maculata) and other species from genus Orchis (as, for instance, O. ustulata) are quite evident. N. maculata is an autogamous species; sometimes self-pollination occurs with the flowers still closed. Neottia. These are entirely brownish-yellow plants, with no green leaves (and therefore no chlorophyll) and an hypogeal apparatus constituted by a short rhizome, from which many short and plump roots originate, forming a mass resembling a bird's nest (hence the name of the only species, N. nidus-avis – Bird's Nest Orchid; pictured below). The flowers are pedunculate, with no spur, an elongated column endowed with a rostellum and no viscidia or bursicula either. This genus is akin to Listera and it is represented among the orchids of Italy and Europe by the sole species mentioned above. The flowers produce nectar and are being visited by numerous insects, mainly Dipterans; the most important reproductive mechanism, however, seems to be autogamous. Cases have been reported in which plants of Neottia have managed to blossom and to produce seeds even when entirely underground! Nigritella. We have already mentioned the affinity between genus Nigritella and genus Gymnadenia. As for genus Nigritella, its sub-species are characterized by a flower with a labellum pointing upwards and with a very short spur; the plants are of very small dimensions and strictly connected to montane habitats. In these last few years several works have been published on these orchids, and as a consequence – as with other genera – the number of described species has increased considerably. As far as the orchids of Italy are concerned, from the original two species indicated in the ‘historical’ Flora d’Italia complied by Pignatti (1982) we have today eight species; however, the systematic position of some of them still has to be properly defined. The four ‘older’ species are: N. corneliana, N. rhellicani, N. rubra and N. widderi; the four new ones (described here briefly) are 1) N. buschmanniae: similar in its general outlook to N. widderi, it is however distinct for the apex of the flower, which is more rounded; the colour is also slightly darker; in any case, there is no risk of confusion, as N. buschmanniae is an Alpine species exclusive to some stations in the Brenta Dolomites, while N. widderi – in Italy – grows only in the Apennines; 2) N. cenisia is very similar to N. corneliana from a morphological point of view; it is distinguished only by the much darker colour of the flowers; in Italy it is signaled only in the Alpe Graie and Cozie, not far from the French border; 3) N. dolomitensis is in most respects akin to N. rubra and it differentiates uniquely for the side margins of the labellum, less lifted up; for the time being, it is signaled only in South Tyrol and – tentatively – also in Trentino; 4) N. nigra subsp. austriaca is in most respects impossible to distinguish from N. rhellicani when seen in nature, with which – as a matter of fact – shares distribution and habitats; it does differ from N. rhellicani, however, for its chromosome number as well as for the flower bracts with smooth margins. From a reproductive point of view, the species of Nigritella are divided into two groups: the diploids – with sexual reproduction – and the polyploids, with apomittic reproduction. There have been also numerous data published on the pollination of N. rhellicani: it seems like the pollinating insects are among Lepidoptera and Coleoptera; even though most authors seem to agree on signaling these as the most frequent visitors, the small dimensions and the dark colour of the flowers, the shortness of the spur and the very penetrating scent all seem to point to a flower better suited for pollination by Dipterans. It is also to be noticed that the apomittic species (at least the Italian ones) have all maintained a very strong scent, and a quantity of nectar not dissimilar to the allogamic species: these are apparently useless characteristics, which would seem to prove a more recent origin for the apomittic species when compared (and as opposed) to the allogamic. 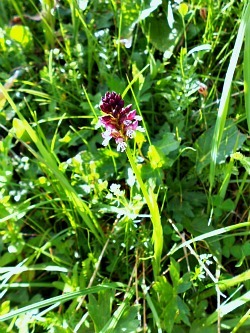 Below, the 'classic' Black Vanilla Orchid (N. nigra) – whose perfume evokes that of chocolate – is pictured in the open fields and meadows that lead to Monte Faverghera Botanic Garden, at about 1,500 m of altitude. Ophrys. Few other orchids are so easily recognizable at first sight such as those belonging to genus Ophrys. Their most prominent characteristic is constituted by a labellum with no spur and more or less extensively covered in hairs, which on the whole reminds of an insect’s belly. Sometimes the resemblance with the insects is increased by other flower parts, such as in O. insectifera. Genus Ophrys has a wide distribution from the Canary Islands to the Caspian Sea and from Scandinavia to Northern Africa, with the highest concentration of species around the Mediterranean sea (in the picture below, O. apifera, Bee Orchid – a typical species of fresh mountainous climates, with many varieties and forms. 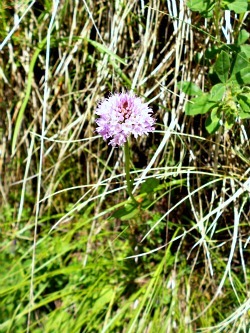 The image was taken in the pastures near Passo della Raticosa, in the Northern Apennines). In few other genera within the plant's kingdom was registered such an increase in the number of newly described species as in genus Ophrys. One will have to wait for the results of the studies with molecular markers in order to understand whether the criteria currently being adopted for the species’ discrimination are more or less valid. The first data obtained with such research techniques – even though they appear at all preliminary – show very small genetic distances even between morphologically well differentiated species, which makes one suppose a forthcoming drastic reorganization in the number of species currently being recognized, which according to some authors are already well above 150. With this premise, it goes without saying that the actual description of species is to be taken as provisional, and it is forcibly a compromise between the viewpoint of the different scholars writing on orchids and the taxonomy currently in use. 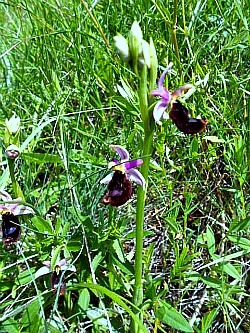 The pollination mechanism of orchids belonging to genus Ophrys has been studied quite in depth. It is based on the emission of volatile substances (pheromones), able to exercise a strong sexual attraction on the males of some Hymenoptera insect species. These, additionally spurred by other tactile and visual stimuli, in the vain attempt to mate with the flowers – mistaken as the females of their species – take away some of the pollen (pollinia), which they will then transfer on to another flower, in a further attempt at mating. From the reproductive point of view, the genus Ophrys can be divided into two groups: one is constituted by those species in which the pollinating insect positions itself with the abdomen turned towards the apex of the labellum – and as a consequence the pollinia of the orchid adhere to their head; the other group includes the species in which the shape of the flowers leads the insect to position itself with the head turned towards the apex of the labellum, and thus the pollinia will adhere to the lower part of the insect’s body instead. If to every species of Ophrys corresponded one and only species of pollinating insect, the presence of natural hybridization would be virtually impossible. In reality, one observes an extraordinarily high number of natural hybrids – some even among species belonging to the two different groups mentioned above, which suggests some caution in the use of pollinating insects as a discriminating character among the species of Ophrys. In O. apifera an additional pollination mechanism is present: in the absence of visits on the part of the insects, the caudicula that support the pollen masses are folded forwards, taking the pollen in direct contact with the underlying stigma, and thus effectively carrying out self-pollination. The autogamous nature of genus Ophrys is therefore particularly favoured in those areas and environments where the presence of insects is scarce. 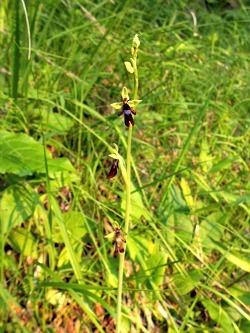 Some Ophrys species, also, give origin to new plants through the production of supplementary rhizotubers: this mechanism is particularly frequent in O. bombyliflora, but it is also present in other species (below, see a representative of this wide genus, O. insectifera – Fly Orchid – in an image taken in the lower, sunnier reaches of Alpago). Orchis. On the basis of recent studies on genes (plants genetics), the division of genus Orchis – as it was intended up to recently – into three different genera was suggested; nevertheless, for the sake of simplicity, in this context the traditional nomenclature with the single genus has been maintained, as it is advisable to wait for further research to be carried out. This is a necessary step in order to clarify in a more definitive way the systematic of genus Orchis (and of other genera akin to it), while avoiding running the risk of adopting a nomenclature that could soon be overridden. It has to be said, however, that there are not many doubts left on the fact that Orchis species are clearly divided into two groups, with different chromosome numbers. 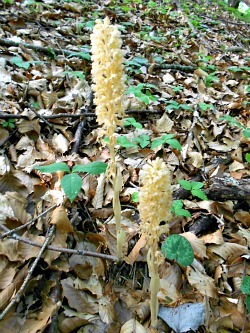 The characteristics of genus Orchis (in the traditional sense) are the presence of a spur (except for O. anthropophora), of distinct viscidia, of only one bursicula and of entire rhizotubers. 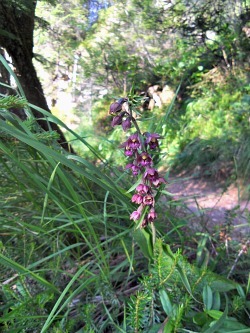 The area of distribution of this genus comprises almost the whole of Europe, Northern Africa, the Near East and Central Asia, with the highest concentration of species in Southern Europe (in the picture below, O. purpurea – Lady Orchid – portrayed in the pastures near Passo della Raticosa, in the Northern Apennines). In the majority of Orchis species the flowers are devoid of nectar, but they can nonetheless attract bees and bumblebees by ‘imitating’ flowers that, on the contrary, do have nectar. There is no precise information neither on the pollinators of O. anthropophora (a species with no spur) nor on those of O. quadripunctata and O. brancifortii – two species with a very slender spur. However, in Sicily I have once witnessed an insect with a very long proboscis belonging to genus Bombylius (or a similar Dipterans) visiting the flowers of O. brancifortii after having visited Fedia cornucopiae (Valerianaceae); in all likelihood, this may have prompted pollination, as it is evident that there is a strong similarity between the two flowers, despite their belonging to different families. Consequently, also for O. brancifortii it is possible to hypothesize a pollination via “floral mimesis” – as in fact it happens for most of the other species belonging to genus Orchis. Among the orchids of Italy, the only Orchis species endowed with nectar is O. coriophora, which is being pollinated by several Hymenoptera insects and some Dipterans (Syrphidae; in the image below, O. militaris – Military Orchid – pictured in the Cansiglio Botanic Garden). Platanthera. The Italian species of genus Platanthera are characterized by the presence of only two (rarely three) elongated leaves at the base of the stem, turnip-shaped rhizotubers, an angular stem, strip-like labellum, narrow and elongated spur, distinct viscidia and no bursicula. The flowers are perfectly adapted to pollination by night butterflies: the pale colour, intense smell, very narrow and elongated spur ensure that the nectar be reached by the long proboscis of butterflies only. The hybrids between the two Italian species are not very frequent: the close pollinia in P. bifolia, in fact, generally adhere to the basis of the insect's proboscis, while in P. chlorantha the pollinia get normally stuck at the base of the butterflies’ heads. That is enough to make cross-pollination between the two species very complicated, even when they are being visited by the same butterfly. Pseudorchis. It is a mono-specific genus, characterized by rhizotubers which are elongated, semi-cilindric and split at the base; the flowers have a short spur and the viscidia are distinct, with no bursicula. Various authors agree in indicating butterflies as the main pollinators of P. albida; as a matter of fact, in this species, only the thin proboscis of these insects could reach the nectar through the narrow aperture of the flowers’ spur. The production of capsules in decidedly elevated percentages has also led to suggest self-pollination among the reproductive mechanisms. Spiranthes. The most obvious characteristic of the species belonging to this genus is the spiral disposition of the small flowers, determined by the torsion of the upper part of the stem (hence the name). Other characteristics are: sepals and petals similar between them, forming together with the labellum a tubular structure; a forked rostellum and an underground apparatus constituted by 2 to 6 tuber-like roots, either cylindrical or fuse-shaped. Despite the fact that the flowers are very small, pollination is carried out by huge Hymenoptera species – especially bumblebees, which reach the nectar produced at the base of the labellum with their long proboscis. Serapias. The genus Serapias is quite uniform from a morphologic point of view. The flowers are characterized by a labellum without spur and divided into two portions by a marked tight spot; the sepals form a tubular structure with the base portion of the labellum (hypochile), while the petals are much narrower than the sepals and generally concealed by the latter; the leaves are narrow, linear or lanceolated. As for the reproductive structure, there is only one viscidium with a single bursicula, while the pollinia are two, with their respective caudicula; in addition, the column terminates with an elongated apex. This genus has a wide distribution, especially across the Mediterranean: an area entirely comprised between the Azores in the west and the Caucasus and Near Asia to the east, Northern Africa to the south and Central France to the north. Most Serapias are diploids, with only one species – S. lingua, which is tetraploid. Bar only very few exceptions, all species of Serapias have no nectar, and are pollinated by non-social Hymenoptera species (those that form no colonies), which use the small tube formed by the sepals and the hypochile as a shelter; cross-pollination is guaranteed by the habit that these insects have of visiting several flowers before choosing the one where they would spend the night or shelter from the cold, wind and rain. One exception is represented by S. parviflora, whose flowers self-pollinate even before opening. Completely different is the pollination mechanism for S. lingua, which uses scents and other substances able to attract the males of a small Hymenoptera species, Ceratina cucurbitina; it also seems likely that the huge callus at the base of the labellum – a unique characteristic within the genus Serapias – carries out an important role in attracting these insects. Traunsteinera. The flowers of this species are endowed with a spur, a rostellum which is clearly tri-lobed and distinct viscidia, only partially covered by a bi-lobed bursicula; the rhizotubers are both entire and ovoid-shaped. 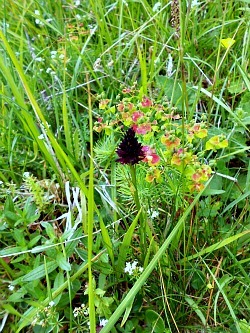 It was suggested by several authors that T. globosa – the only species within this genus to be present among the orchids of Italy and Europe – is being visited by various insects that mistake the inflorescence of this orchid for that of other plants which grow in the Alpine pastures – such as Scabiosa columbaria (Dipsacaceae) and Valeriana montana (Valerianaceae) – thus inadvertently activating the pollination process; below, the blossoms of T. globosa – Italy's only Traunsteinera species – are portrayed at a relatively low altitude (about 600 m) on the slopes of Alpago.